Both houses of the state legislature will be on the floor Tuesday. The State Senate is set to take up a short calendar of four bills. Senate Bill 49, authored by Senator Howard Marklein (R – Spring Green), will receive a vote before the body. 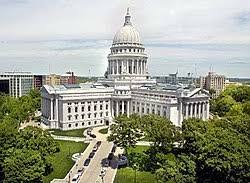 The bill mirrors language currently in Governor Walker’s budget proposal bill by increasing funding for broadband expansion grants. The bill transfers $6 million from the Universal Service Fund (USF) at the Public Service Commission (PSC) for broadband expansion grants. The USF is funded by an assessment imposed by the state on telecommunications ratepayers. The bill also allows unencumbered balances in the USF to be put towards broadband expansion grants in the future, and allows the PSC to fund its administration of the grants using funds in the USF. Senator Marklein has another bill on the floor that day. Senate Bill 62 authorizes school board members to refuse his or her salary if they desire. Meanwhile, the State Assembly is taking up eight bills including a bill expanding the ability for individuals to administer epinephrine injections in emergency situations. Authored by Representative Andre Jacque (R – Two Rivers), the bill is a follow-up to legislation passed in 2015, which allowed businesses and organizations to receive proper training to obtain epinephrine auto-injectors for emergency use. Epinephrine auto-injectors are used on individuals suffering a severe allergic reaction. The new bill, Assembly Bill 96 allows any properly-trained person to be prescribed an epinephrine auto-injector. Representative Jacque argues that while most people with severe allergies already have epinephrine auto-injectors, not everyone who has a severe allergy is aware they have it. The representative points to a case in 2014 in which a Manitowoc man died of a previously unknown bee sting allergy. The bill unanimously passed the Assembly Committee on Health, and is expected to pass the full Assembly. The State Assembly is scheduled to begin its floor session at 1:00pm following the annual State of the Tribes address. The State Senate will commence its session at 11:00am.